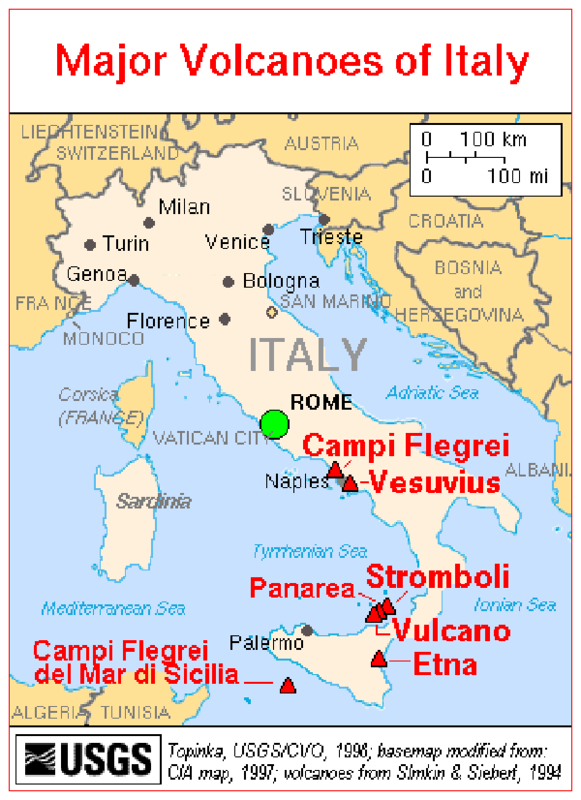 Active Italian volcanoes (Stratovolcano Etna). - Crust and Upper mantle structure imaging. - P-wave travel time tomography. 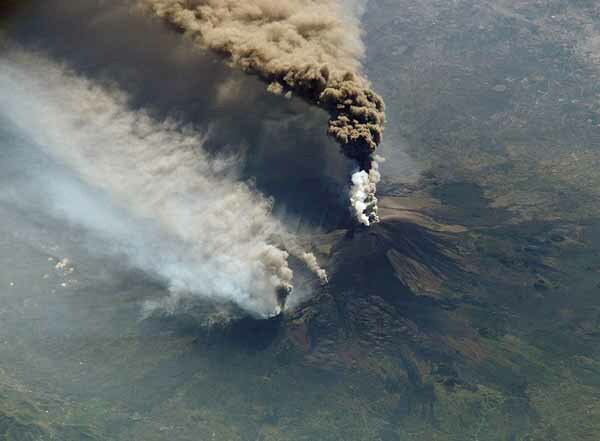 - Photos from the Etna volcano eruption. 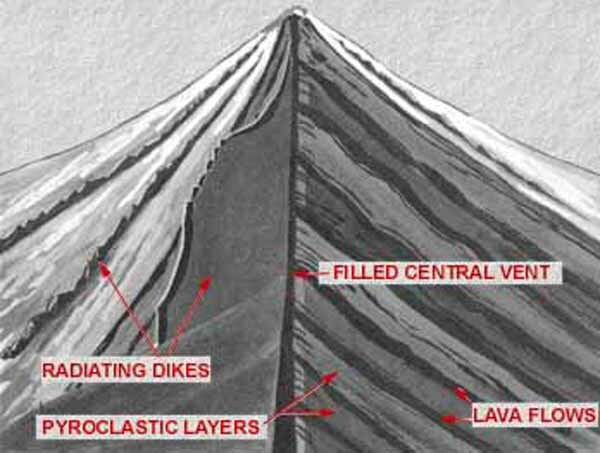 Schematic cross-section of a typical stratovolcano showing composite, stratified nature with alternating layers of lava and tephra. Stratovolcanoes have a layered or stratified appearance with alternating lava flows, airfall tephra, pyroclastic flows, volcanic mudflows and/or debris flows. The compositional spectrum of these rock types may vary from basalt to rhyolite in a single volcano; however, the overall average composition of stratovolcanoes is andesitic. Many oceanic stratovolcanoes tend to be more mafic than their continental counterparts. The variability of stratovolcanoes is evident when examining the eruptive history of individual volcanoes. Mt. Fuji and Mt. 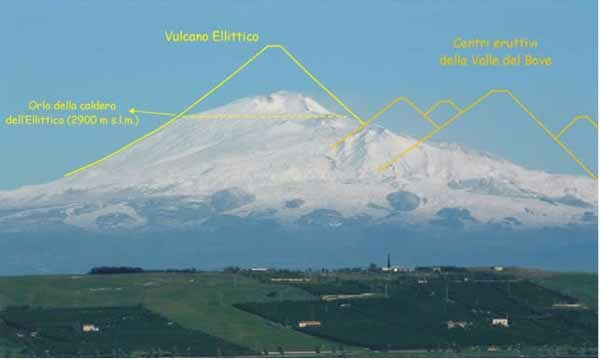 Etna, for example, are dominanted by basaltic lava flows, whereas Mt. Rainier is dominated by andesitic lava, Mt. St. Helens by andesitic-to-dacitic pyroclastic material, and Mt. Lassen by dacitic lava domes. 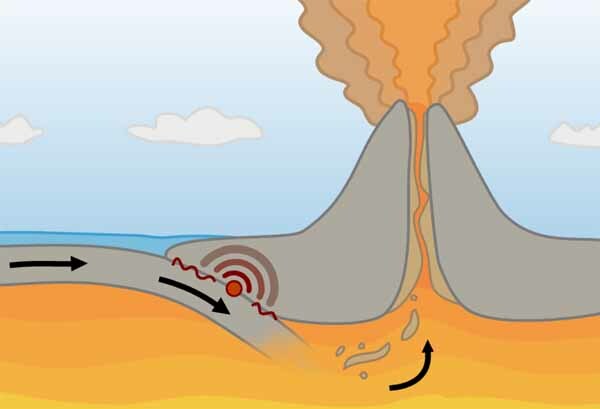 Stratovolcanoes typically form at convergent plate margins, where one plate descends beneath an adjacent plate at the site of a subduction zone. Examples of subduction-related stratovolcanoes can be found in many places in the world, but they are particularly abundant along the rim of the Pacific Ocean, a region known as Ring of Fire. In the Americas, the Ring of Fire includes stratovolcanoes forming the Aleutian islands in Alaska, the crest of the Cascade Mountains in the Pacific Northwest, and the high peaks of the Andes Mounains in South America. Etna's eruptions have been documented since 1500 BC, when phreatomagmatic eruptions drove people living in the eastern part of the island to migrate to its western end. The volcano has experienced more than 200 eruptions since then, although most are moderately small. Historic eruptions are recorded for the year 479 B.C., 1329, 1381 and 1536, one of the largest and most destructive eruptions was a flank eruption in March to July 1669 from near the village of Nicolosi (800m a.s.l.) 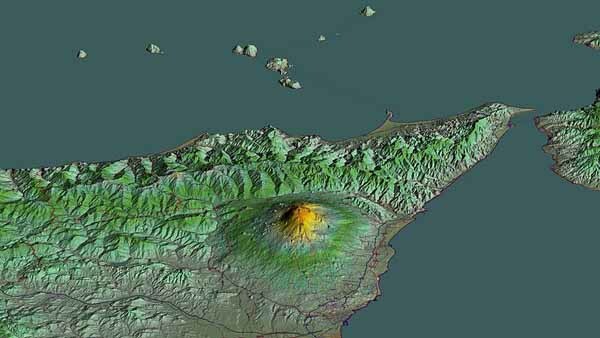 which produced the cinder cone Monti Rossi and a 14km long lava flow which, despite it was partially deviated from its path by a artificial dam, destroyed part of the city of Catania, obstructed the harbour and caused victims. Cinder cones on Etna erupted again in 1763, 1811, 1852, 1865, 1879 and 1892. In the 20th century, concentrated on two main branches extending from the crest, lava erupted in 1908, 1910, 1911, 1918, 1923, 1928, 1942, 1947, 1949 and 1950-1951, 1964, 1968, 1971, 1981, 1983, 1989 and 1991 (the most voluminous eruption since 1669) to 1993. The activity continues in the 21th century, from 2001 Etna is more or less active (in 2002 and 2003 the volcano produced spectacular ash plumes), weaker since 2008 now the activity increased again since 12 January 2011. 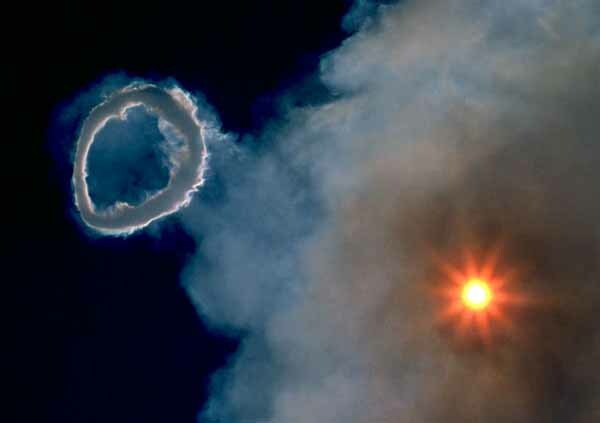 Two styles of eruptive activity typically occur at Etna. Persistent explosive eruptions, sometimes with minor lava emissions, take place from one or more of the three prominent summit craters, the Central Crater, NE Crater, and SE Crater (the latter formed in 1978). Flank vents, typically with higher effusion rates, produce eruptions from fissures that open progressively downward from near the summit (usually accompanied by strombolian eruptions at the upper end). Cinder cones are commonly constructed over the vents of lower flank lava flows. Lava flows extend to the foot of the volcano on all sides and have reached the sea over a broad area on the SE flank. Thousands of years ago, the eastern flank of the mountain experienced a catastrophic collapse, generating an enormous landslide. The landslide left a large depression in the side of the volcano, known as 'Valle del Bove' (Valley of the Ox). The most prominent morphological feature of Etna is the Valle del Bove, a 5 x 10 kilometer horseshoe-shaped caldera open to the east. Research published in 2006 suggested this occurred around 6000 BC, and caused a huge tsunami, which left its mark in several places in the eastern Mediterranean. It may have been the reason the settlement of Atlit Yam (Israel), now below sea level, was suddenly abandoned around that time. The most recent collapse event at the summit of Etna is thought to have occurred about 2,000 years ago, forming what is known as the Piano Caldera. This caldera has been almost entirely filled by subsequent lava eruptions, but is still visible as a distinct break in the slope of the mountain near the base of the present-day summit cone. (a) Geological map of Mount Etna, from the INGV-Catania (http://www.ct.ingv.it/index.php?option=com_content&view=article&id=161&Itemid=211〈=it&showall=1) web site. Key: 1. Recent alluvial deposits; 2. Mongibello (past 15,000 years) eruptive products (2a) "Chiancone" volcaniclastic debris deposit; 3. Ellittico eruptive products; 4. Valle del Bove centers eruptive products; 5. Timpe phase eruptive products; 6. Basal Tholeiites; 7. Sedimentary basement; "Faglia" = fault, "Orlo della Valle del Bove" = Valle del Bove rim; "Crateri Sommitali" = Summit craters (b) Geological cross section through Etna volcano in the north-south direction . 1. The Basal Tholeiitic phase - the first phase of volcanic activity in the Etnean area occurred about 500,000 years ago, in an area then occupied by a broad bay - referred to as the pre-Etnean gulf - leading to the emission of submarine lava (pillow lava) and associated debris, which is known as hyaloclastite. 2. The Timpe phase - the second main phase of Etnean volcanism occurred between >220,000 years ago and about 110,000 years ago in a narrow belt along the Ionian coast along a fault system known as the "Timpe" (the steps). The Timpe faults are marked by conspicuous morphological scarps, and terminate to the NNW near Moscarello and Sant'Alfio on the east flank of Etna. 3. The Valle del Bove centers phase. About 110,000 years ago, the focus of volcanism shifted from the Ionian coast into the area now occupied by the Valle del Bove. 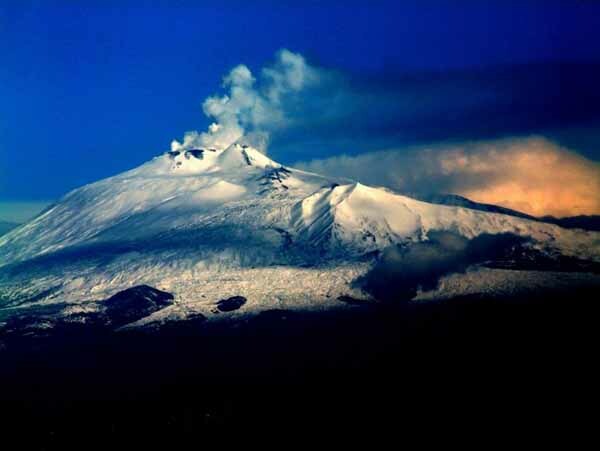 In this period, the character of Etna's activity underwent a profound change, from sporadic fissure eruptions as during the first two phases, to a more centralized activity of both effusive and explosive character. 4. The stratovolcano phase. 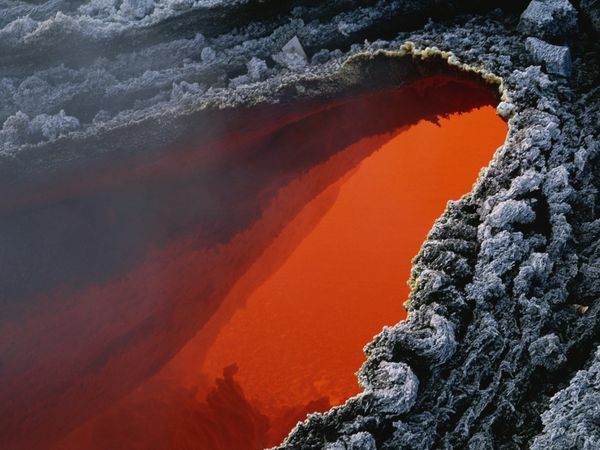 About 60,000 years ago, a further shift in the focus of eruptive activity toward northwest marks the end of the Valle del Bove centers, and the start of the building of the largest eruptive center of Etna, now named Ellittico (the elliptical), which constitutes the main structure of the volcano. 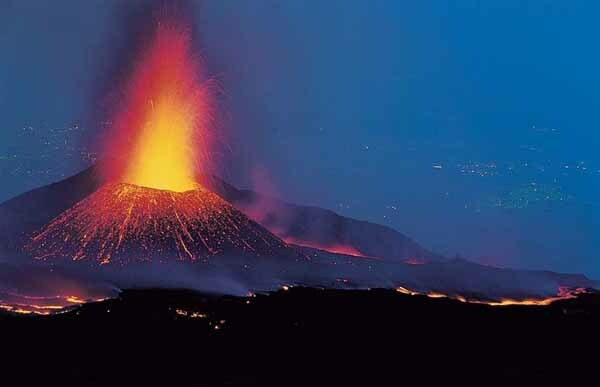 The Ellittico volcano produced intense effusive and explosive activity, constructing a large edifice, whose summit may have reached a height of 3600-3800 m. Numerous flank eruptions generated lava flows that reached the Simeto river valley to the west of Etna. Volcanic eruptions can broadly be described as explosive, accompanied by violent fragmentation of magma, or effusive, dominated by the steady outpouring of lava. Mount Etna displays an unusual eruptive style combining permanent strombolian explosions with frequent lava fountains and gas emission. A possible explanation for this complexity comes with a new analysis of the primary magma composition that suggests that the source of Etna's volcanism is gradually changing from mantle upwelling, to magma generated by subduction processes — a switch from effusive to explosive volcanism. Mount Etna is associated with the subduction of the African plate under the Eurasian plate, which also produced Vesuvius and Campi Flegrei, but is part of a different volcanic arc (the Calabrian rather than Campanian). 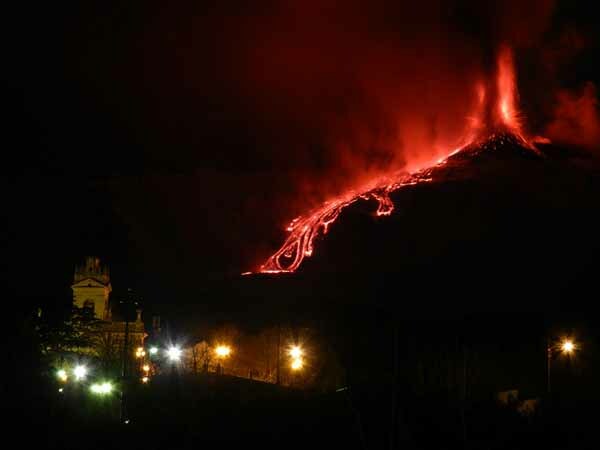 A number of theories have been proposed to explain Etna's location and eruptive history, including rifting processes, a hot spot, and intersection of structural breaks in the crust. Scientists are still debating which best fits their data, and are using a variety of methods to build a better image of the Earth's crust below the volcano. 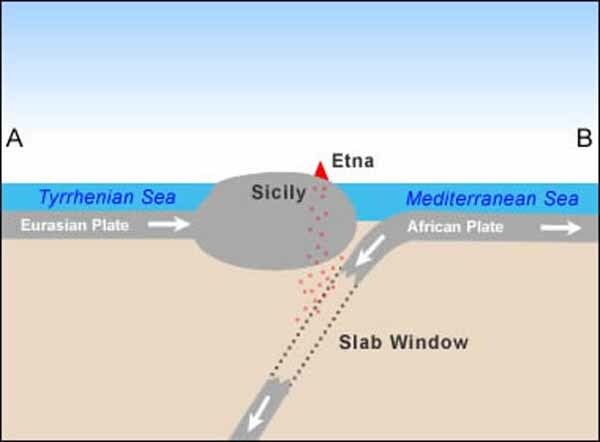 Simplified plate tectonics cross-section showing how Mount Etna is located above a subduction zone formed where the Eurasian and African plates collide. In this subduction zone a window has torn in the subducting slab. This leads to the tearing open of a gap between the subduction setting of the Ionian oceanic lithosphere and the Calabrian arc to the east, and the continental collisional setting of Sicily to the west, which in turn causes decompression and the formation of magma in the upper mantle below this opening gap, or "window". The magma rises along the intersection of a number of major regional fault systems and feeds the activity of Etna. Crust and Upper mantle structure imaging. Seismic methods using natural earthquakes are commonly applied to investigate the velocity structures of the Erath's crust and upper mantle. Among all these methods, seismic tomography is one of the most powerful tools to image the Earth’s structure. 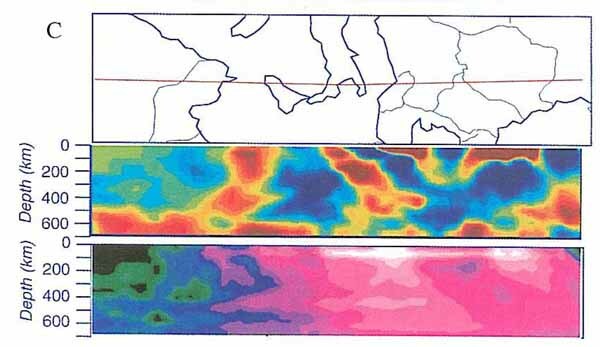 Imaging the Mediterranean upper mantle by P-wave travel time tomography (Piromallo С., Morelli A., 1997). 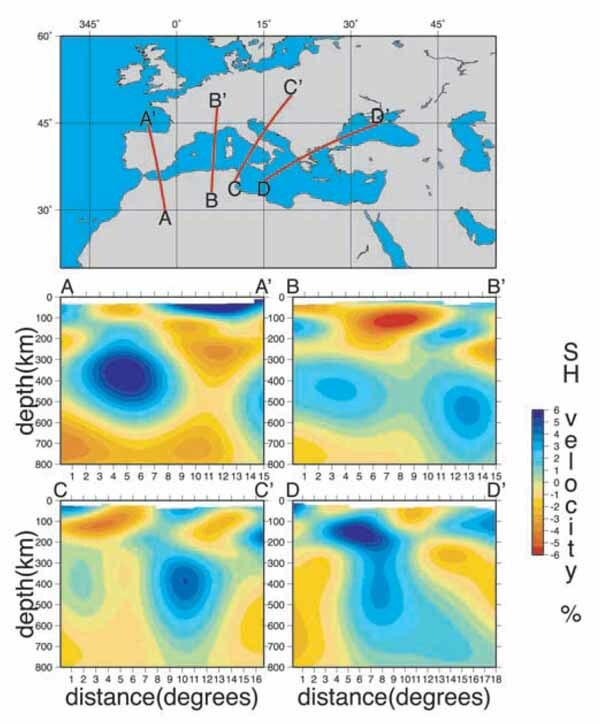 Travel times of P-waves in the Euro-Mediterranean region show strong and consistent lateral variations, which can be associated to structural heterogeneity in the underlying crust and mantle. The regional and teleseismic data from the International Seismological Centre data base were analyzed in order to construct a three-dimensional velocity model of the upper mantle. The model was parameterized by a 3D grid of nodes - with approximately 50 km spacing - with a linear interpolation law, which constitutes a three-dimensional continuous representation of P-wave velocity. The tomographic images show general agreement with other seismological studies of this area, with apparently higher detail attained in some locations. The signature of past and present lithospheric subduction, connected to Euro- African convergence, is a prominent feature. Active subduction under the Tyrrhenian and Hellenic arcs is clearly imaged as high-velocity bodies spanning the whole upper mantle. The western section of the Alps appears to have better developed roots than the eastern, possibly reflecting à difference in past subduction of the Tethyan lithosphere and subsequent continental collision. From a large set of fundamental-mode surface wave phase velocity observations, was mapped the transversely isotropic lateral heterogeneities in the upper-mantle shear velocity structure. The Mediterranean basin is a high-resolution region for imagining the upper mantle underlying. The inverse problem was formulated as surface wave sensitivity kernels for each pixel of a 2◦ × 2◦ starting model, including the high-resolution global crustal map Crust 2.0. It was found that the available surface wave data can resolve the most important geophysical features of the region of interest, providing a reliable image of intermediate spatial wavelength. Vertical sections through the Voigt average δvS/vS of our model, cut along the red lines shown on the map. Capital letters (A-A', B- B', C-C', D-D') denote the sections’ endpoints. The white layer at the top of each section represents the crust; note the strong lateral variations in the depth of the Moho (Boschi, L., G. Ekstrom, and B. Kustowski 2004). 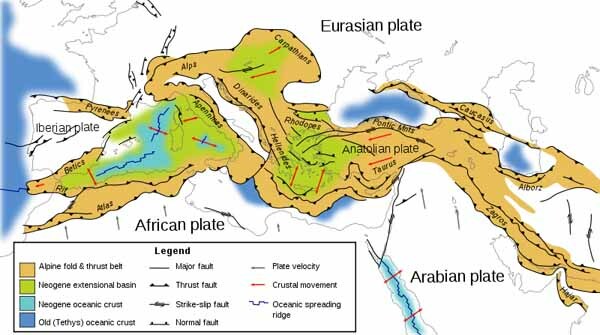 Vertical sections of the Mediterranean upper mantle and transition zone are also dominated by fast anomalies associated with the subduction of Africa under Eurasia. Subducting slabs are imaged under the Iberian peninsula (section A-A'), the western Mediterranean (B-B') and the Aegean arc (D-D'). 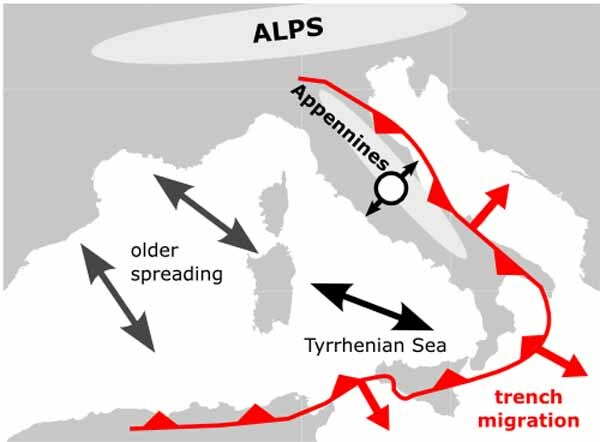 Fast anomalies which were possibly originated by past subduction are present under the Alps (B-B') and the Adriatic sea (C-C'). The vertical gradient of δvS/vS to be maximum at depths of 100 km and 300 km, where there appears to be a change in the shape of subducting slabs. 1. Boschi, L., G. Ekstrom, and B. Kustowski. 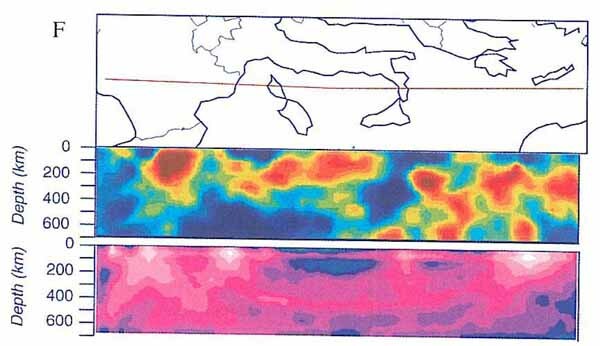 (2004) Multiple resolution surface wave tomography: the Mediterranean basin, Geophys. J. Int., 157, 293–304. - http://www.ct.ingv.it/index.php INGV - Sezione di Catania. - http://geology.com/volcanoes/etna/ Mount Etna Volcano, Italy: Map, Facts, Eruption Pictures. 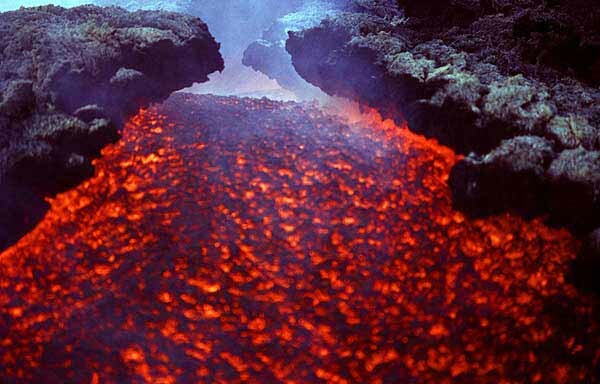 - http://geology.com/volcanoes/ Volcanoes and Volcanic Eruptions - Facts and Information. 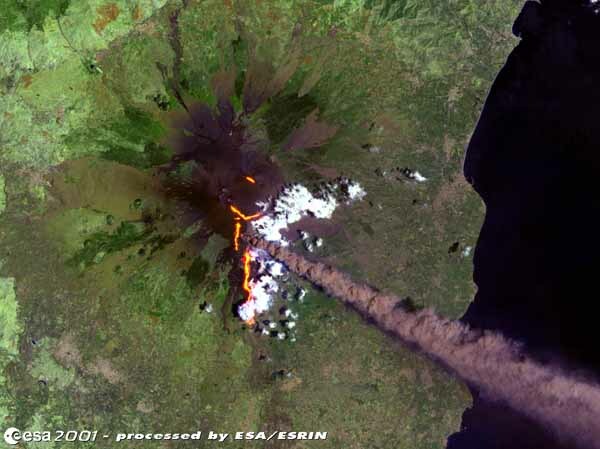 - http://www.nature.com/nature/links/010830/010830-1.html Geology: Mount Etna changes sources. - http://www.ct.ingv.it/index.php?option=com_content&view=article&id=161&Itemid=211〈=it&showall=1 Evoluzione geologica del Monte Etna. 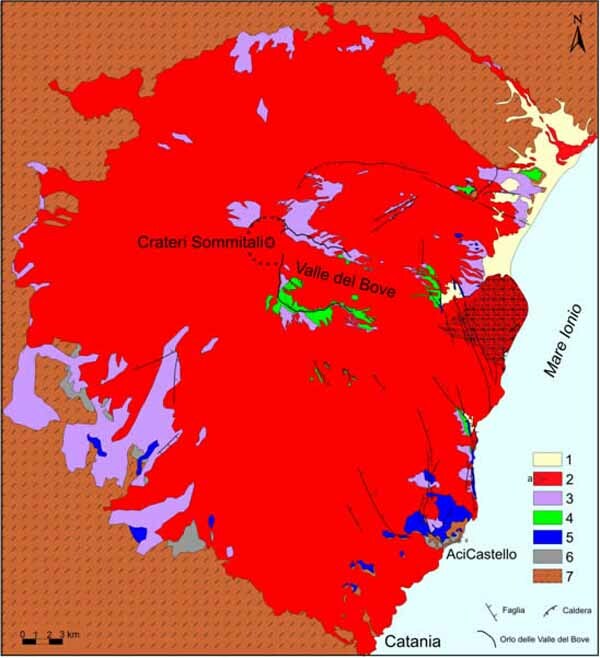 - http://scienceblogs.com/highlyallochthonous/2009/04/medtect.png Etna region plate moving map. - http://scienceblogs.com/eruptions/2010/08/mount_etna_-_brief_anatomy_of.php Etna Week (Part 1) - Brief Anatomy of an Exceptional Volcano : Eruptions. Photos from the Etna volcano eruption.